In New Express Scripts Data: The Drug Spending Slowdown Is Real, I analyzed the latest drug trend report from pharmacy benefit manager (PBM) Express Scripts. 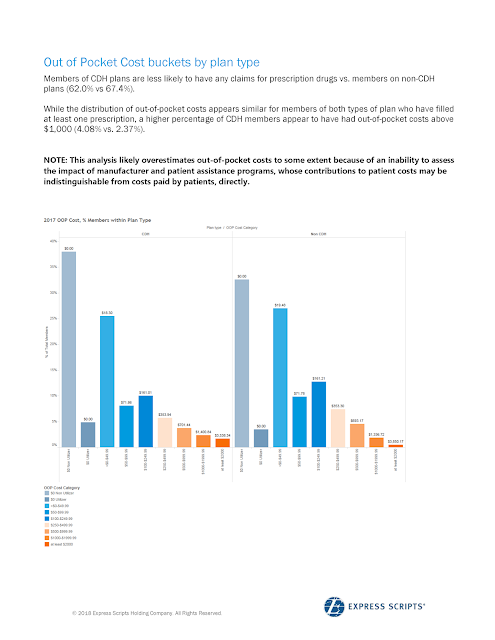 To complement our earlier analysis, Express Scripts was kind enough to provide Drug Channels with an exclusive analysis showing the distribution of out-of-pocket costs for nearly 26 million people. Despite consumer surveys complaining about “high drug prices,” the reality is that most people don’t pay much for their prescriptions. In 2017, about 95% of people with commercial insurance had less than $40 per month in out-of-pocket prescription costs. About half of them paid nothing, because they filled no prescriptions. The remaining few percent had thousands of dollars in out-of-pocket obligations—though it’s not clear how much they actually paid. Given these findings, plan sponsors—health plans and employers—should be cautious before blocking copayment support for the small number of patients taking specialty drugs. As Dr. Lucy Van Pelt says: Happiness is being able to afford necessary medication. Express Scripts analyzed 2017 claims data for 25.7 million people with commercial insurance. About 21% of the people had a high deductible health plan, which Express Scripts refers to as a "consumer directed health plan" (CDH). The high-deductible group was less likely to have a prescription claim in 2017. Only 62% of people with a high-deductible plan had a claim (i.e., were “utilizers”), compared with 67% in the traditional plan group. This makes sense given the potential for self-selection. People who expect to have higher expenses will choose a plan with greater insurance coverage. There is one important caveat to these data. Express Scripts was unable to include the effect of manufacturer copayment support and patient assistance programs. Therefore, the data likely overestimate out-of-pocket costs. Click here to download full details about the sample and methodology. For 2017, average yearly out-of-pocket spending for utilizers in the high-deductible plan was $269, compared with only $200 for utilizers in the traditional plan group. Here’s a look at the distribution of this spending, which highlights the bifurcation in patients' out-of-pocket costs. Most people paid relatively little in out-of-pocket costs for their prescriptions, but some people spent a lot. More than 85% of people spent less than $20 per month in out-of-pocket costs for prescription drugs. Among those with a high-deductible plan, 42.9% spent nothing ($0) and 43.6% spent less than $250 annually. Among those with a traditional plan, 36.1% spent nothing ($0) and 49.6% spent less than $250 annually. A smaller group spent about $40 per month. About 9.4% of people in high-deductible plans and 11.9% of those in traditional plans had out of pocket costs from $250 to $1000. For 2017, average annual out-of-pocket costs were $492 and $482, respectively. That equates to about $40 per month. A few people had very high out-of-pocket costs—though they may not actually have paid these amounts. For 2.4% of the people with high-deductible plans, out-of-pocket costs averaged $1,400. For a further 1.7%, average costs were $3,538. For 1.9% of the people with traditional plans, out-of-pocket costs averaged $1,336. For a further 0.5%, average costs were $3,850. It’s likely that actual spending was less than the out-of-pocket cost figures shown above. That’s because Express Scripts can’t detect when a patient uses a manufacturer’s copayment support as the secondary payer. These programs are not permitted at Express Scripts' mail pharmacies, but are utilized at its Accredo specialty pharmacies when consistent with the plan’s formulary. The third group of patients likely included people taking specialty medications for complex illnesses as cancer, rheumatoid arthritis, multiple sclerosis, and HIV. Patients today are being asked to pay a significant share of prescription costs for more-expensive specialty drugs, because of high coinsurance amounts. See the benefit design data in Employer Pharmacy Benefits in 2017: More Cost-Shifting to Patients As Tiers and Coinsurance Expand. Alas, advice would be more acceptable if it didn't always conflict with our plans.